The British Library has not only put online its fantastic Catalogue of Illuminated Manuscripts , it has also effectively put them in the Public Domain, even though they are technically still in copyright in the UK until 2040. There are obviously lots of marvellous images there - in fact 35,661 of them from 4,231 different manuscripts - but with shuddering predictability we've focused on the search term 'shed'. 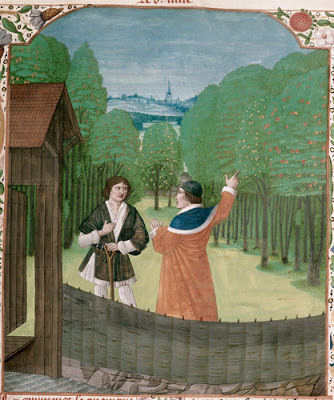 Pictured above and below are a couple of results from Petrus de Crescentiis's Ruralia commoda in a French translation attributed to Jean Corbechon, dating from the Netherlands in the late 15th century. 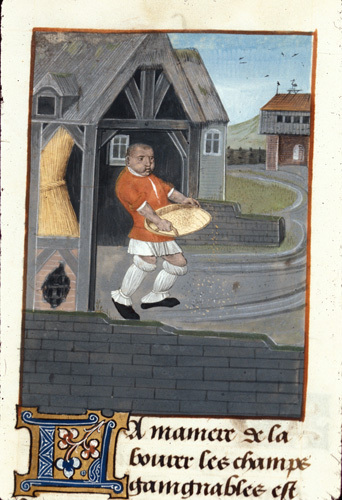 Above is a man winnowing wheat, below the author in an orchard (might he have shedworked in that shed? ).